There are many things we can do in this life, but when all is said and done and we pass away it is the works we did for the Lord that means anything at all. (Matthew 16:24-26). Then said Jesus unto his disciples, If any man will come after me, let him deny himself, and take up his cross, and follow me. 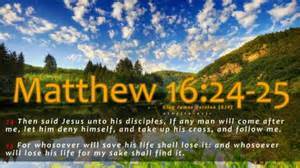 For whosoever will save his life shall lose it: and whosoever will lose his life for my sake shall find it. For what is a man profited, if he shall gain the whole world, and lose his own soul? or what shall a man give in exchange for his soul? Jesus did many mighty works while He lived, and when the people would not believe that He was in His Father and His Father in Him He told the people to then at least believe in the works (Miracles) He had shown them. Before He left He said those who believe on Him and the works He did we too would do and even greater for He was returning to His Father. (John 14:10-12). Believest thou not that I am in the Father, and the Father in me? the words that I speak unto you I speak not of myself: but the Father that dwelleth in me, he doeth the works. Believe me that I am in the Father, and the Father in me: or else believe me for the very works’ sake. Verily, verily, I say unto you, He that believeth on me, the works that I do shall he do also; and greater works than these shall he do; because I go unto my Father. The myriad of things one can attain in this life are unending, and a man’s labor brings many blessings to one’s life. What we gain in this life is great, but the best gift we can give ourselves is the knowledge of Christ that we enjoy in this life and the one to come. (1 Corinthians 15:58). Therefore, my beloved brethren, be ye stedfast, unmoveable, always abounding in the work of the Lord, forasmuch as ye know that your labour is not in vain in the Lord.